Sandwiches. I don’t know about you but they just sound boring to me. Slices of meat between two pieces of dry bread with maybe some mayo or mustard or ketchup and few obligatory pieces of cheese and lettuce. Fine, maybe I’m exaggerating it a little, but I have never been a fan of sandwiches because I find them un-interesting and not worth the calories ingested. Until of course, I found Mile End Sandwich. 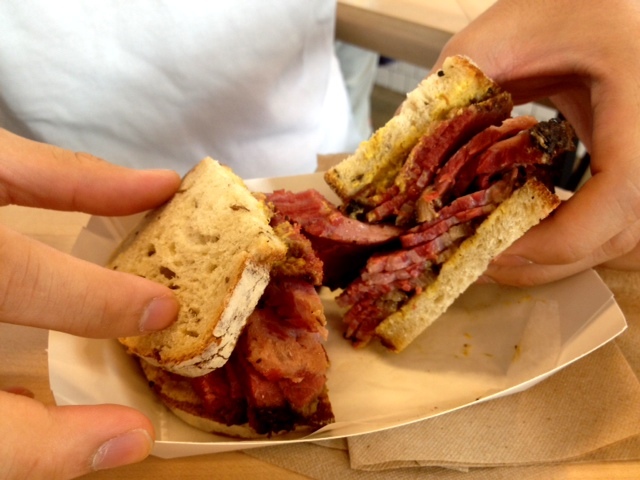 They call themselves a Jewish deli, but in my mind, they are more than that. They are the purveyor of well crafted sandwiches, jewish or otherwise. Heck, they even serve POUTINE! 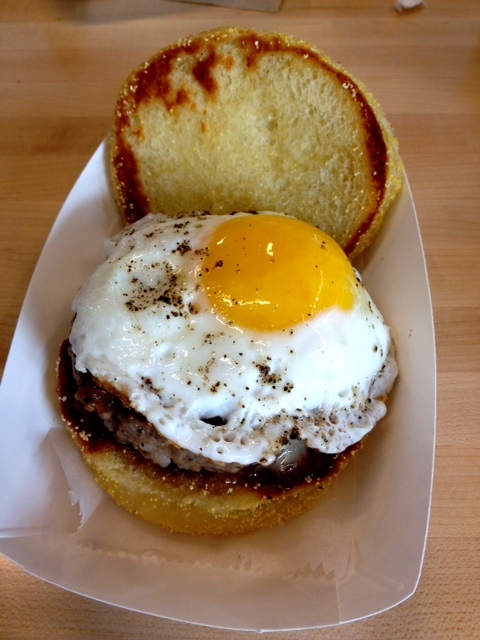 I’ve only tried 4-5 items from their menu, but I have to say that my favorite is the breakfast burger, served with veal sausage patty, apple butter, maple syrup on an english muffin and topped with an over easy egg. Absolutely divine. I had egg yolk dripping all over my fingers by the time I was done with the burger. Smoked Meat: The brisket is incredibly moist. Just like it would be at 2nd Ave Deli. I’m not a fan of rye bread, since it can get dry at times. 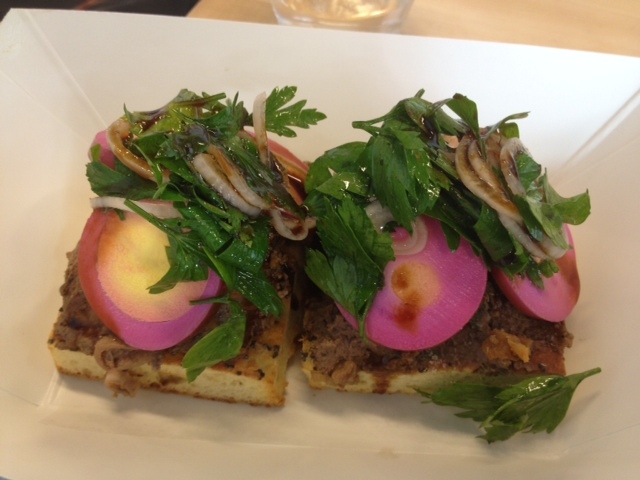 Chopped Liver: Not very livery, if you were worried about that. The garnish makes it a little hard to eat, everything falls apart whichever way you try to shove it into your mouth. But it is delicious nonetheless. 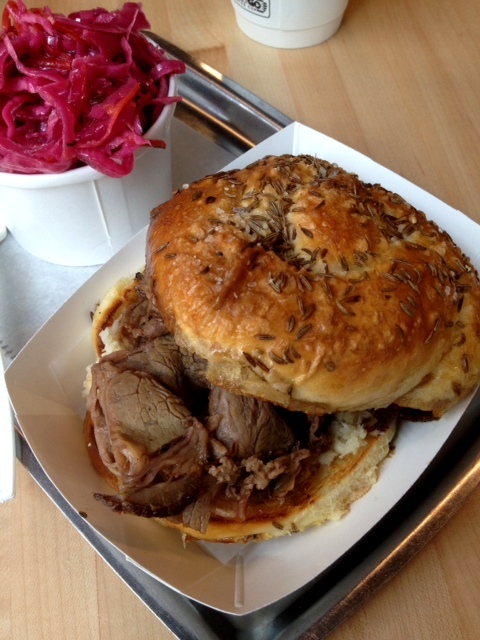 The weck roll is on the salty side, but it’s soft and very tasty. The mustard does give a kick to the sandwich, but also renders the roll a little soggy if you don’t eat it fast. The beef is moist but I actually prefer the roll on its own, maybe with some mustard.